It isn’t difficult to locate the properties sporting wrought iron gates in Brisbane. They command attention from onlookers with their grand, stately elegance and sophistication. Much more than an accessory for a driveway, the entire look, feel and presentation of a property is instantly altered with the addition of a wrought iron gate! Whether you want to channel Victorian style charm, or add a unique and modern twist, wrought iron gates create homes with a difference. If you are looking for that WOW factor, or a quick and easy way to boost the value of your property, a wrought iron gate is your answer! But before you choose a wrought iron gate, you will need to consider the installation process, which can be complicated depending on the nature of your property. It can be tempting for a DIY buff to attempt to install their new wrought iron gate themselves. Aside from being a fun project, it has the added allure of saving you some cash. But there are some important considerations you will want to be aware of before making your purchase and subsequent installation attempt! First of all, wrought iron gates are not to be taken lightly; literally. The grand standing beauties are every inch as heavy as they look, making them considerably more difficult to install and manoeuvre than an ordinary gate. While self-installation may save you some pennies initially, running the risk of injury could create a much heftier problem (and bill) down the track. Months off work, gruelling physiotherapy sessions…this is the reality for many DIY enthusiasts who have attempted gate installation beyond their level of expertise. Leaving it to the professionals could be considered a long term investment. Your back will be sure to thank you for it! Installing wrought iron gates – DIY or professional job? So how difficult is the installation process for wrought iron gates? This will be partly dependant on the type of gate you select. Narrow gates designed for pedestrian use are more manageable than larger gates, for example. Ornate and unique designs may also prove difficult to lift and manoeuvre due to their unusual shapes and angles. Like most gates, the initial stages of installation require digging holes for your posts and setting them with concrete. Once these support posts are fully stable, you can install an appropriate hinge and latching system. All sounds fairly straight forward, right? But if your measurements are inaccurate, even slightly, you may end up with gates that don’t open and close properly – which is annoying, unsightly and potentially even dangerous. In addition, large gates place more of a stress on their support posts, so it is especially critical that these gates are installed correctly. If the posts can’t support the strain, your wrought iron gate will be out of alignment (and hence of out action) before you even have a chance to admire them. Considering an automated system? These gates have the added step of installing the accompanying motors. Here, you will need to check state and territory building codes, and possibly your home insurance, to see whether a qualified electrician is required to do the wiring. Not quite so straight forward anymore is it? No-one wants to be dealing with recurring (and potentially costly) problems due to a poorly installed gate. Get it done right the first time and your beautiful household accompaniment will be set in stone for decades to come! Another thing to consider when installing your wrought iron gates in Brisbane is the tools and materials required. Some of the items you may have lying around, but others you will need to hire ahead of time, or buy them outright. This is a cost factor you’ll need to add to your DIY project, if you choose to go that way. You will also need to have concrete mixed and delivered. If you don’t have these items at your disposal, you could find yourself with a significant hidden cost on your installation. We all live busy lives, and spare time is of the essence. You could spend days slaving over a heavy and lengthy gate installation. Alternatively, you could sit on your deck with a celebratory beverage and watch the pros get to work! There are a lot of benefits to finding reputable wrought iron gate craftsmen to assist you with your installation process. Their job is to design, build and install gates as part of their professional services. Installation is done at a reasonable rate as part of their overall package, saving you both time and the hassle of self-installation. Dean Wilson Iron are south-east Queensland’s premier wrought iron craftsmen. With over 20 years in the business, they are the team behind some of Brisbane’s most iconic wrought iron creations for both homes and businesses. 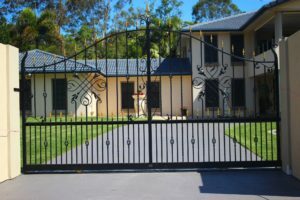 Specialising in custom designed wrought iron gates, they have experience with all kinds of properties, from Queenslander restorations through to some of the city’s most prized mansions. A wrought iron gate is an investment that will last you a lifetime – if it is installed and cared for correctly. Dean Wilson Iron has a genuine passion for every aspect of wrought iron, from creation through to the final touches. Let them assist you to fit your wrought iron gate in Brisbane today! Save yourself the hassle and potential pitfalls of an ill fitted wrought iron gate. Give the award winning team at Dean Wilson Iron a call today on 07 3814 0076 or contact us online for a free quote.